I thought you might be interested in looking at He is here..
Why does she have a hate-on for Target? And, do we think she'll change her tune now that she knows she can scam them out of $5 tights? I don’t know. I think Miniway might have too many books. 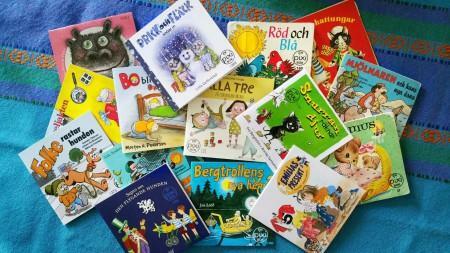 There is a line of children’s books in Sweden called Pixi. They are small, cheap paperbooks (excellent for a small treat or to take travelling) and they have both new stories and old classic ones. After buying their advent calender for five years (the best calender!) and also buying them at other times he has around 200 just of those. I also really love children’s books (honestly one of the reasons I wanted a child at all) and I buy heaps of books, both new and old and also many English ones since he’s bilingual. I loved books as a child as well so we have some of my old ones. He probably has around 500 books (including the Pixi ones) and that is A LOT ... we don’t have time to read them all. We read four at bedtime every night but he is like most children and just wants to read his favourites over and over again. Ahhhhh Pixi books. We have them in Germany too. We had at least a hundred of them. My mum kept almost all of our old books and now we already have them- the babe isn’t even one. She seemed exceptionally happy to hand over two boxes full of Pixi books. So, are you saying what I thought immediately? That's not plain vanilla patriarchy, that's a dom-sub thing. In some patriarchal circles, it would be seen as extra sooper dooper Godly for the wife to call her husband "sir" as a sign of respect for his leadership status. Perhaps Black Sheep can speak more specifically to Peter and Kelly's motivation, but my first guess would be that it's a way of showing off how Godly Kelly was. That poor woman was always being "shown off" to the less-holy Christians, IMO. I don't know much about this woman but, wow. That was an amazingly well handled grift. Very neatly done. My favorite bit was how she herself gets the gravy train rolling by making the first gesture of preparing gift baskets for other pastor's wives. She didn't give them something from her list like prayers or a text. Nope. Gift baskets. Jeezuz. Reading that again just put everything fluttering around back into one neat package. Zoo is a selfish, horrible, immature, nasty, nasty woman.